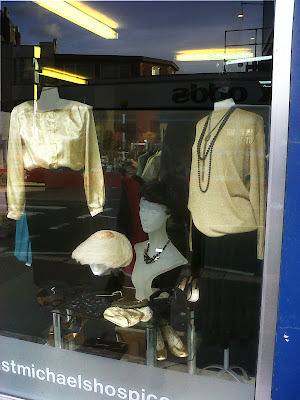 Now, there is a combination that blows away ... Black & Gold it is, and it heralds the party season in vintage style! As I was running around the shop trying to find various bits to put together, this paper bag came in with a set of 3 amazing 50s vintage hats which fitted into my display perfectly! Apparently these hats came into the St. Michael's Hospice Donation Center at the bottom of a black bag full of stuff. My appreciation goes out to all those hardworking Hospice volunteers who go through bin bags after bin bags, sorting and distributing, and very very occasionally stumble upon a treasure like this ... for all you lovely charity shop customers to enjoy!! This week's window includes various black velvet skirts (the black is just so perfect), combined with a golden blouse and a lurex v-neck jumper worn backwards ... AND I TOTALLY REMEMBERED WEARING V-NECK JUMPERS BACKWARDS IN THE 80s - WOW, I HAD COMPLETELY FORGOTTEN ABOUT IT! And then there are various bijou evening bags and golden shoes and these 4 gorgeous 50s hats - one in rose feathers (so beautiful), a cap in black feathers, one with silk bows & a veil and one velvet & veil band. The FRONT ROW GOES TO HOLLYWOOD Fashion Show 2011 is only in a few weeks away, so pop into the shop and get your outfit and hat sorted soon. 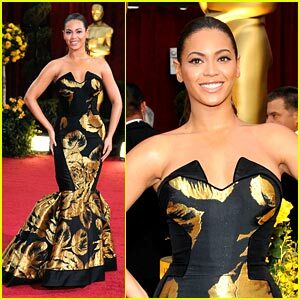 Gold & Black is classic - as you can see worn by Jane Russell & Marilyn Monroe in the 20th Century Vox movie "Gentlemen Prefer Blondes" (1953) and Beyonce on the Red Carpet recently. When i was a child i was very active and i love to running and jumping. My father gave me a surprise by renting an inflatable bouncy castle from amazing jump at my 8th birthday party. I was very happy to jumping with my friends.